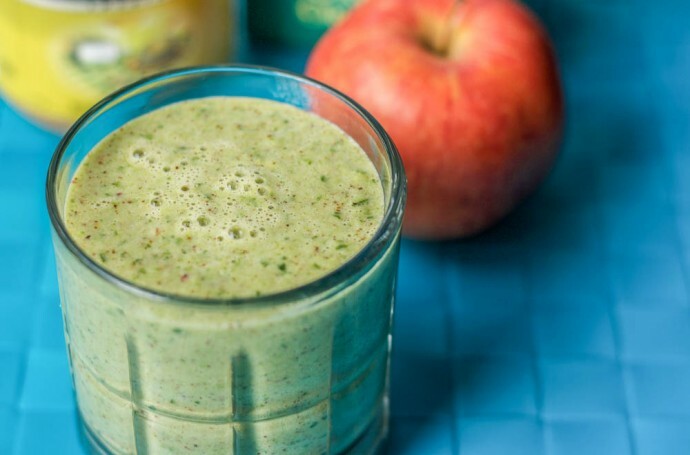 This green smoothie recipe with spinach & almond butter is ah-mazing! This is how the creation came to life: I was at home, hard at work and, as per usual, I forgot to eat lunch and it was 2pm – yikes! I didn’t have a lot of time and needed something to fill up my belly quick. I had the following ingredients in the fridge: spinach, almond milk & almond butter. I whipped them together and voila! 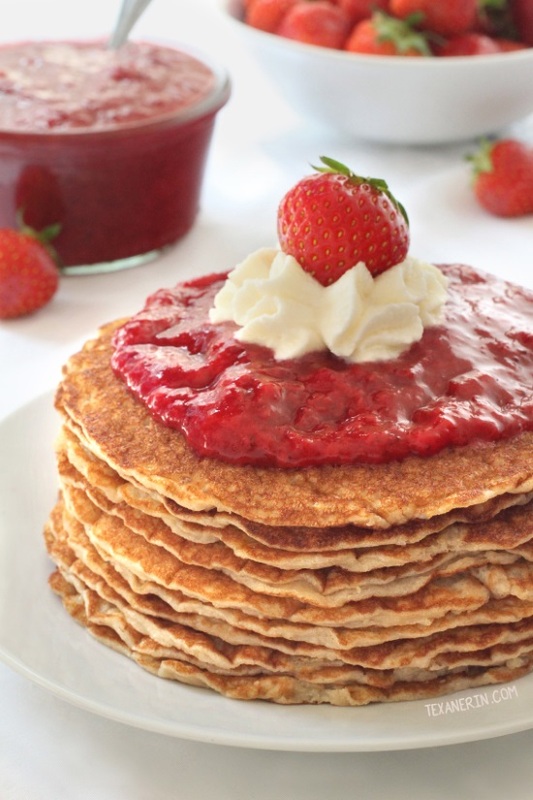 So simple and SO SO VERY delicious!! The combination of apple and almond butter is the best! My body doesn’t like peanut butter so I always use almond butter in anything that I would use peanut butter in and it never disappoints! (Aside: apple + almond butter also makes a super quick and protein packed snack). If you are nut free though, use sun butter (or any other nut free “peanut” butter). My nephew is severely allergic to peanuts so nuts are a big no no at my brother’s house. Whenever I’m at their place, I eat sun butter as my almond butter replacer and it tastes great! (I think almost exactly like peanut butter). So, in case you are nut free, feel free to replace the almond butter with sun butter and I’m sure it will taste super. I’ll be trying this recipe with sun butter instead of almond butter the next time I go to my bro’s house. Throw all the ingredients into a blender (I used a Blendtec) and mix it up! 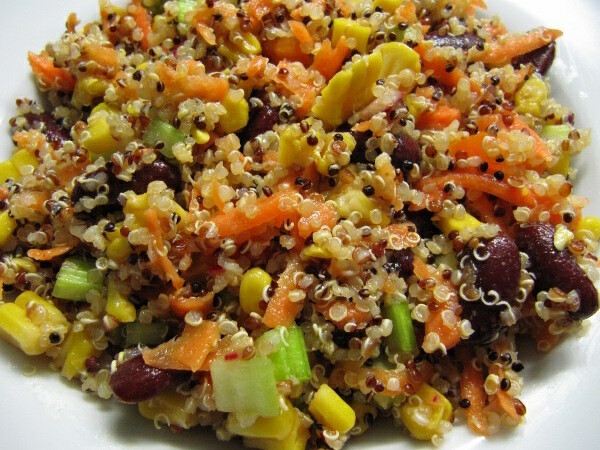 I love me some real simple quinoa salad. 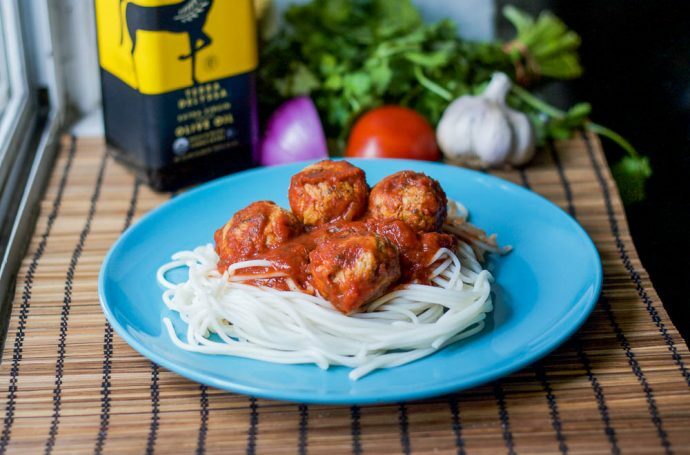 It’s the perfect quick, yummy and nutritious weekday meal. I’m lazy and so I need meals that are complete and packed with protein. Adopting mostly a plant-based lifestyle this isn’t always so easy and so I’m always on the look out for quick, delicious and complete meals. 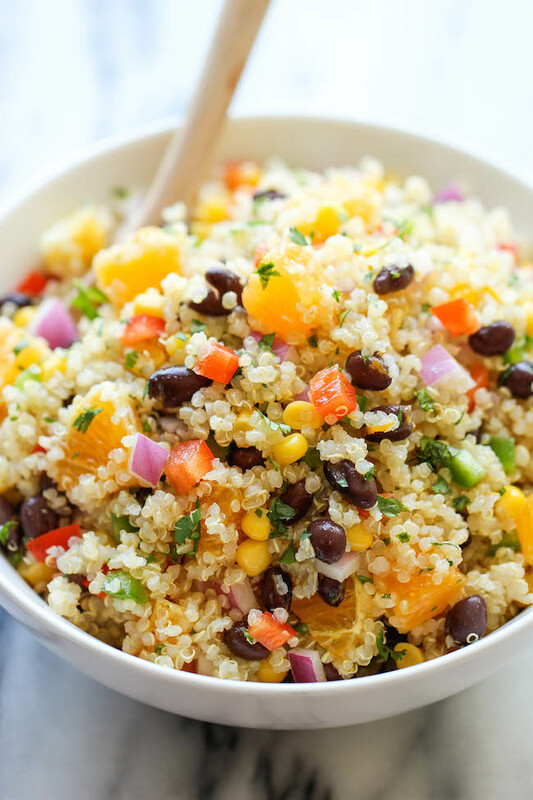 I’ve curated the best real simple quinoa salad recipes that are both vegan and are complete meals with protein. 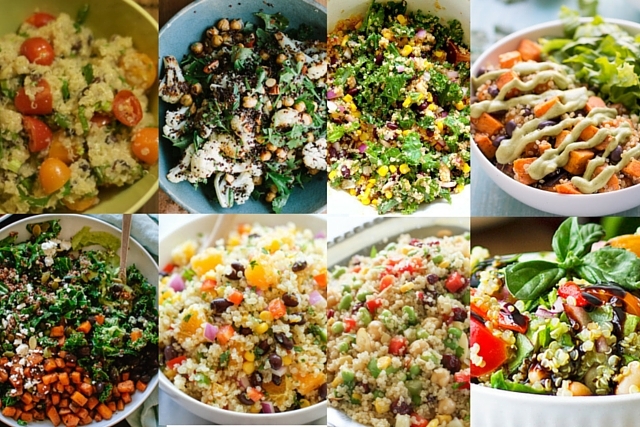 See my roundup below for the the best real simple quinoa salad recipes. Why this makes the cut: Full disclaimer, this is my recipe. 🙂 If you like zesty loaded with garlic and lemon, you will like this one! It’s one of my go-to staple weekday meals. 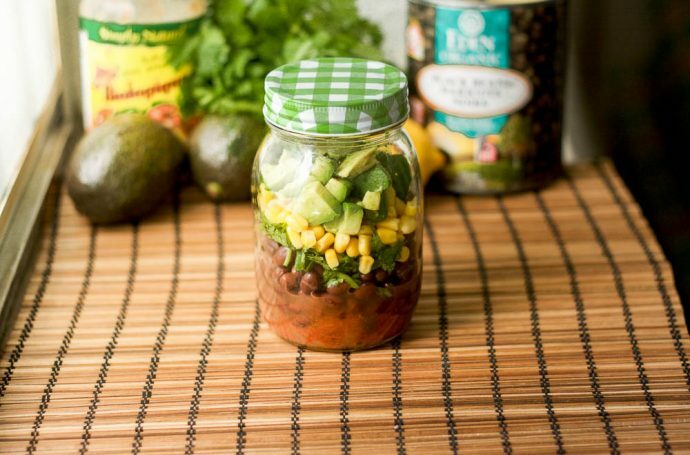 Why this makes the cut: the combination of almonds, jalapeno and lime sounds so delectable! 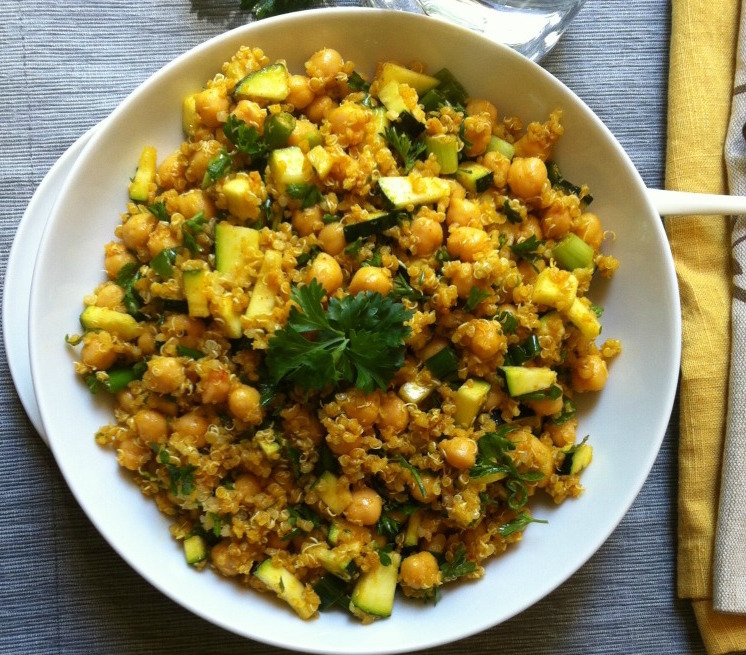 Why this makes the cut: with turmeric, cumin, zucchini and chickpeas, this sounds like the perfect weekday hearty meal. 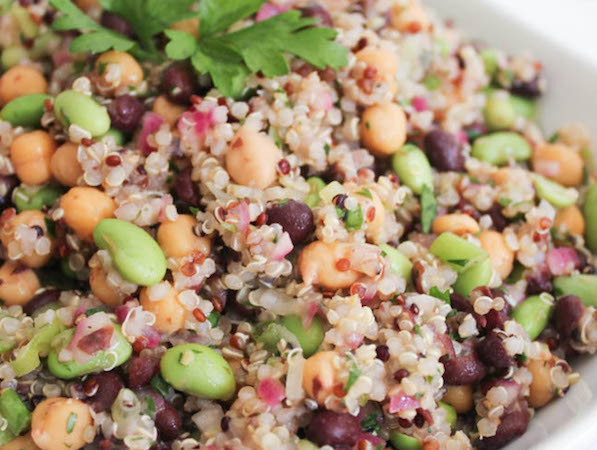 Why this makes the cut: An incredibly hearty and protein packed salad with beans and cranberries, a fabulous combination. 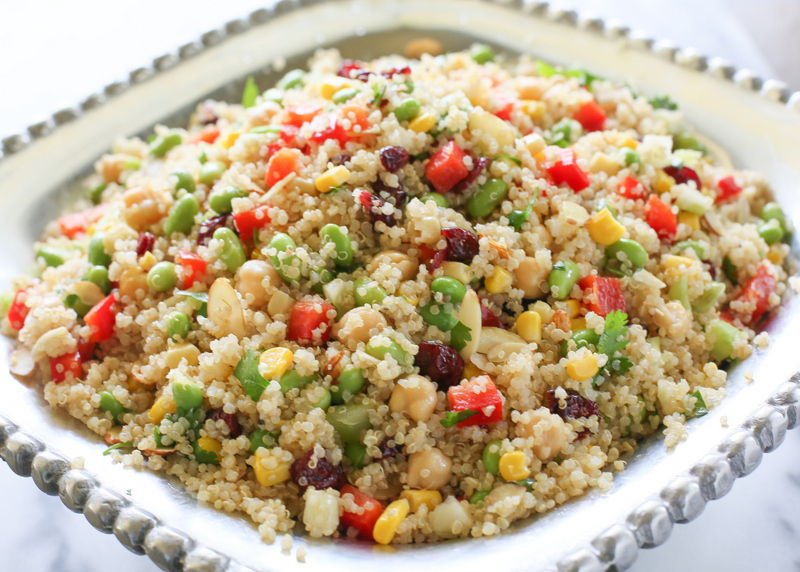 Why this makes the cut: This nut free version of this southwestern style quinoa salad sounds so appetizing. 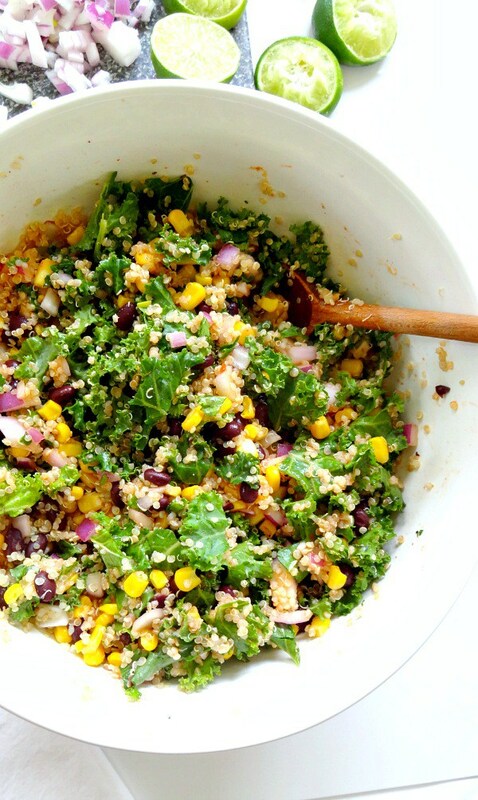 Why this makes the cut: no quinoa salad round-up would be complete without a spicy version. 😛 Plus, it has kale! 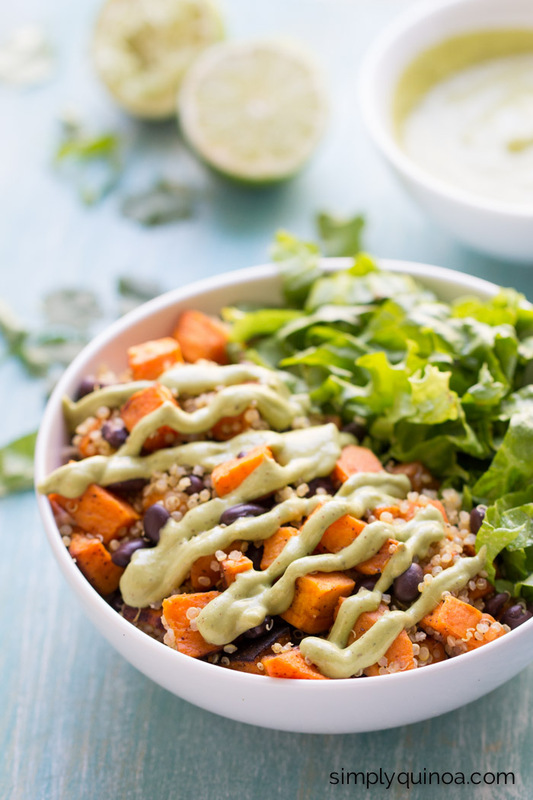 Why this makes the cut: Sweet potatoes with chilli powder and avocado cashew dressing? Yes please!!! 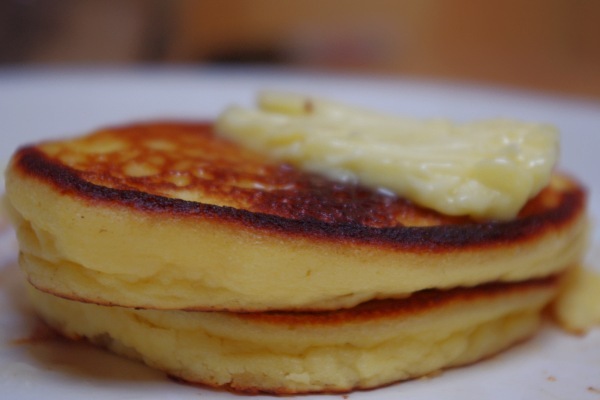 Why this makes the cut: another zesty recipe with orange, orange juice and apple cider vinegar. Why this makes the cut: I’m always looking for ways to use white beans – this one looks delicious! 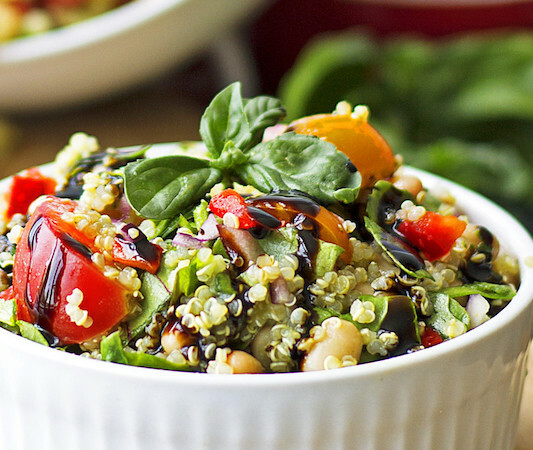 Why this makes the cut: A hearty quinoa salad packed with so many veggies! 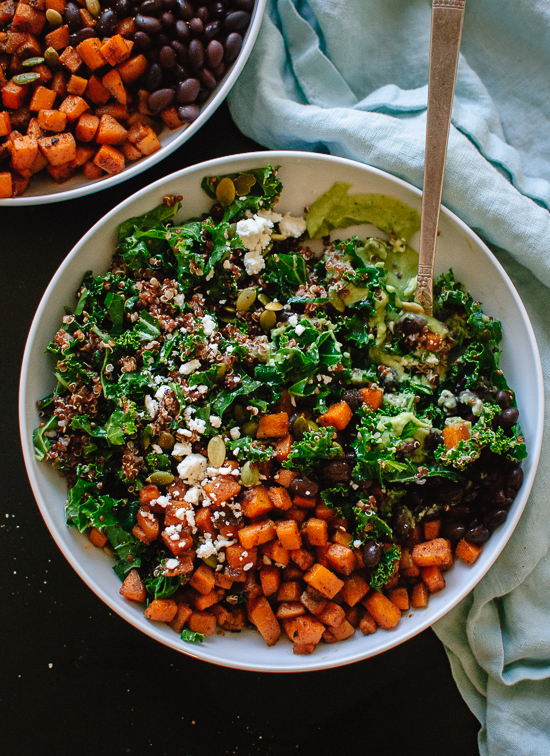 Why this makes the cut: An ultra simple and protein packed salad. 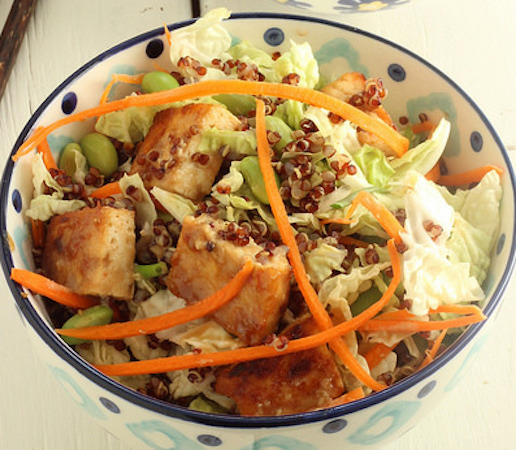 Why this makes the cut: A delicious sweet and spicy tofu quinoa salad recipe. 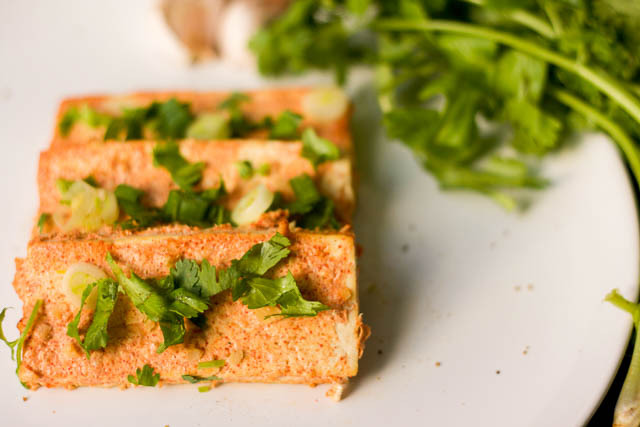 This is by far the best tandoori tofu recipe. I have tried many over the years and this one takes the cake! (or tofu, hehe). My aunt who is a fabulous cook uses this recipe for chicken, I just replaced the chicken for tofu and it was delicious! Not only that, but it was incredibly easy to make – the perfect quick weekday meal. Ideally, you will want to prep this the night before. 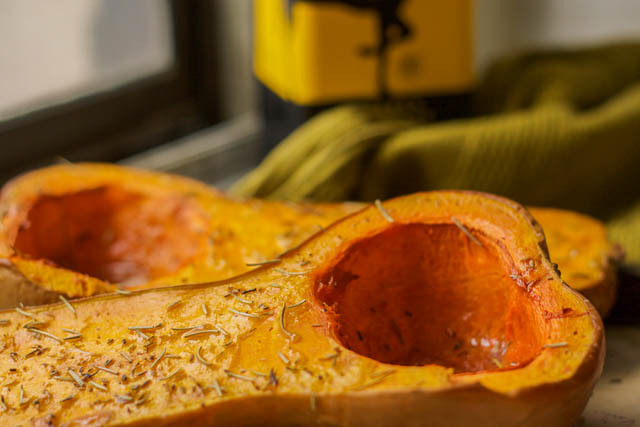 O man, I love me some recipe for baked butternut squash with maple syrup. This is absolute perfect Fall/Winter meal. It’s sweet, delicious and so cozy. A great side to any meal. I ended up eating one half of the butternut squash as soon as I made it (:)) and used the second half for butternut squash soup. Feel free to use this recipe as a base and then go nuts! I’m sure there are so many other variations that would go delicious with a recipe for baked butternut squash with maple syrup. I’m thinking pecans, walnuts, chilli, coconut and the list goes on and on! 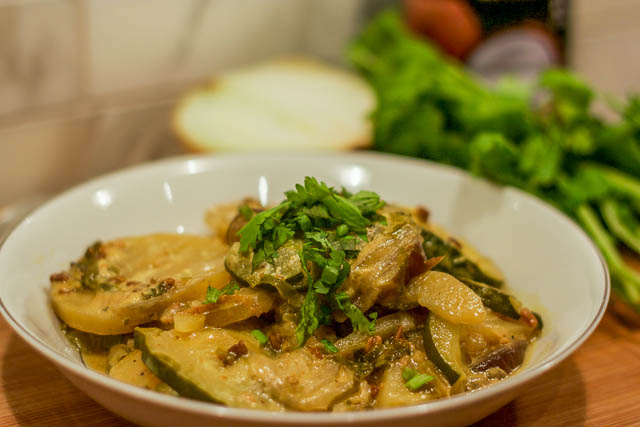 This zucchini curry recipe is a special treat for y’all! This is my 2nd mama’s (i.e. my mama-in-law) mama’s, aka Nani Ma’s, special recipe! It is such a gift and so incredibly delicious. Unfortunately, Nani Ma is no longer with us and I never did get to meet her. 🙁 I hear though that she was an incredibly special and an incredibly sweet lady. I am blessed with the best Mama-in-Law (shout out to Mama P!) and I think she’s the sweetest lady ever! Irfan, my partner, says that Nani Ma was 100x sweeter than my Mama P! If this is in fact true, it is unbelievable! This one is for you Mama P and Nani Ma! Place oil in a small sauce pan or large frying pan over medium – high heat. Now you will have to decide whether you want to make the dish over the stove top or in the oven. If you want to use the oven, you will use a casserole dish type thing, or if you are using the stove, you will use any non-stick large pot/pan where you can layer the veggies. I will provide directions for both options below. Layer all the sliced veggies (zucchini, potato, eggplant and onions) into your casserole dish or non-stick stove top pan. Sprinkle the salt, pepper, green chillies and coriander in between the layers, as you are layering. Pour the coconut mixture over top of the veggie layers ensuring that the mixture goes in between the veggies. Coat the veggies as much as you can (you can kind of move the dish around to swish the coconut mixture). If you are using the stove top, turn heat to high until the mixture just starts to boil then reduce the heat to medium low and cook covered for about 30 minutes. If you are using the oven, place dish in oven and bake for about an hour on 350 degrees (or until the veggies are very soft). You can garnish with chopped coriander. Note: Mama P also told me that sometimes she garnishes with thinly sliced tomatoes before baking the mixture because it looks pretty, we didn’t do this for this recipe but feel free to go for it if you’d like! 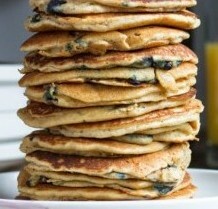 I love doing pancake round-ups, yes this is true. 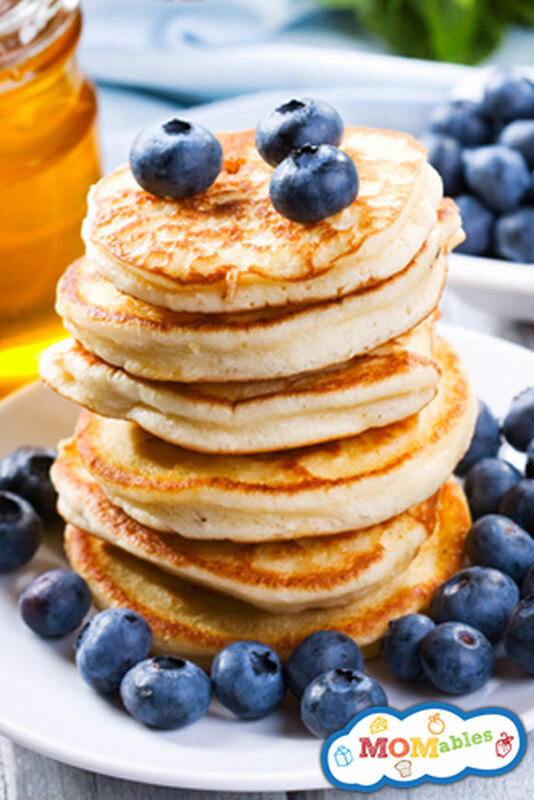 I searched long and hard to find the very BEST grain free pancake recipes for both you and I. 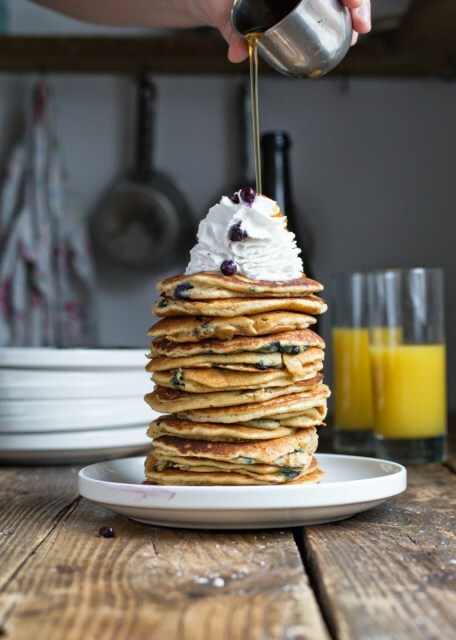 🙂 Between this post and my post for the best vegan gluten free dairy free pancakes from scratch, I should have everyone covered! 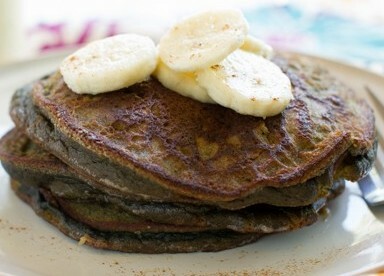 Note most grain free pancakes have eggs and so all but one of the recipes (mine) have eggs. 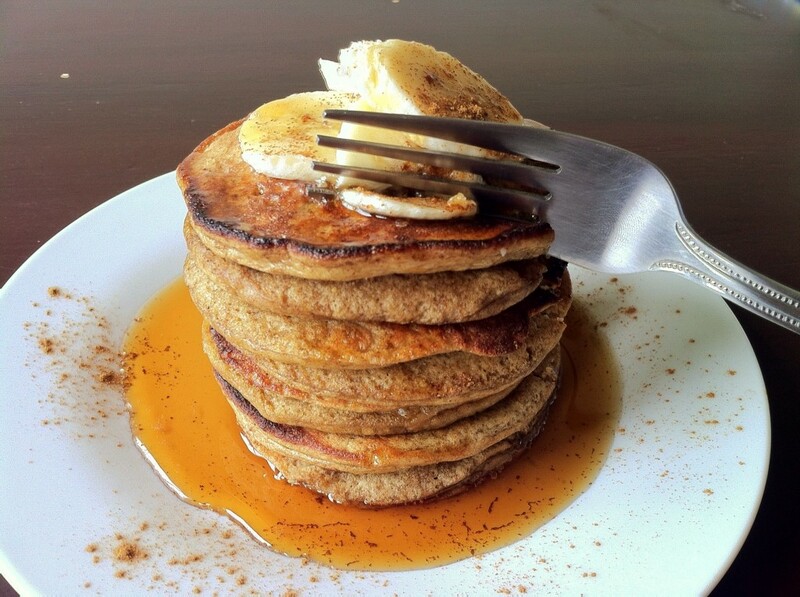 If you can’t have eggs, and want/need grain free pancakes see my post for grain free egg free pancakes. Only of them of is vegan (mine), but all of them are dairy free. None of them are raw. 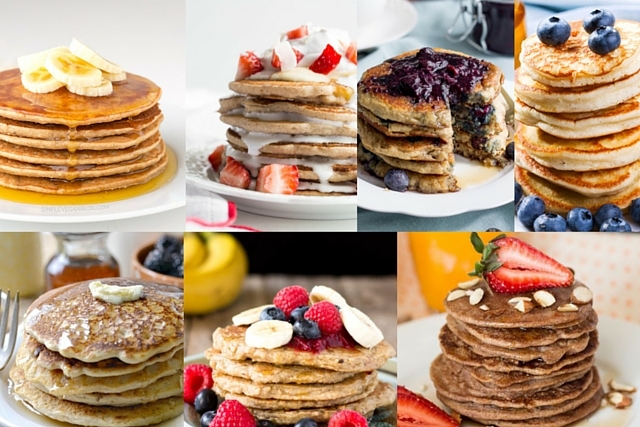 You can make all of them vegan by replacing eggs with a chia egg. 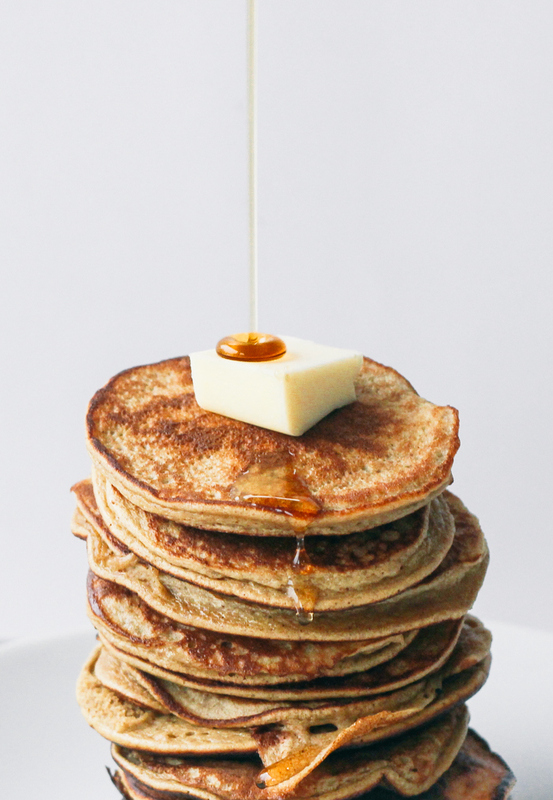 Why this makes the cut: An ultra simple flourless and 2 ingredient recipe. It can’t get any simpler folks. 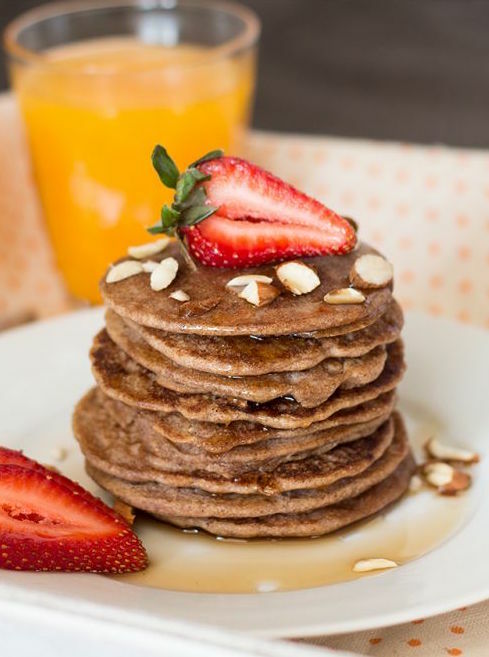 Why this makes the cut: A protein packed pancake with almond flour. 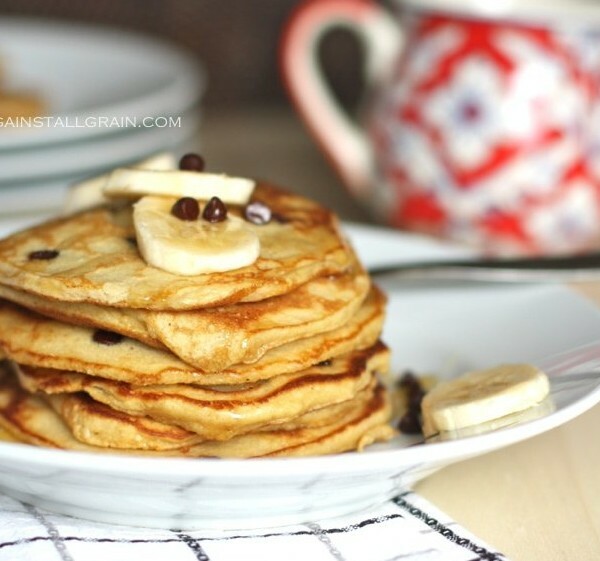 Why this makes the cut: Banana chocolate chip pancakes have got to be my favourite pancakes of all time. 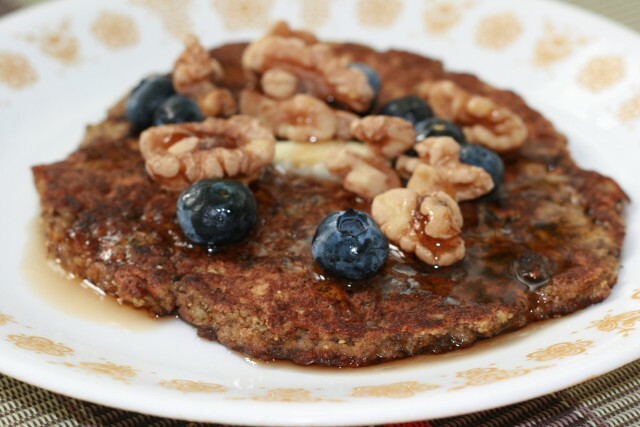 Why this makes the cut: A great nut like but nut free pancake with sun butter! 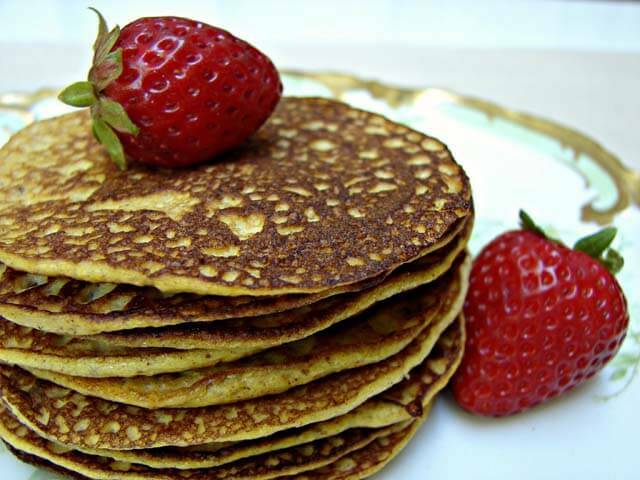 Why this makes the cut: A simple grain free pancake recipe that is also nut free! Why this makes the cut: This is my recipe. 🙂 I wanted grain free pancakes that were also vegan. I couldn’t find anything online so I made one myself – it turned out terrific! 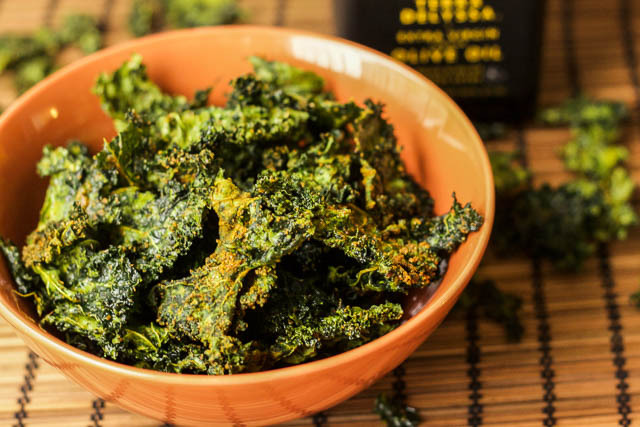 What are the best type of kale chips? Kale chips indian style! I grew up eating amazing Indian-Pakistani style foods so I take any chance I can to make stuff with an indian twist! I had a couple of friends coming for dinner and needed a delicious appetizer. This did the trick and was such a hit! Is using dehydrator, “cook” until crispy (this will vary depending on your humidity level, it is quite dry during this time of year in my apartment so it took about 2 hours). 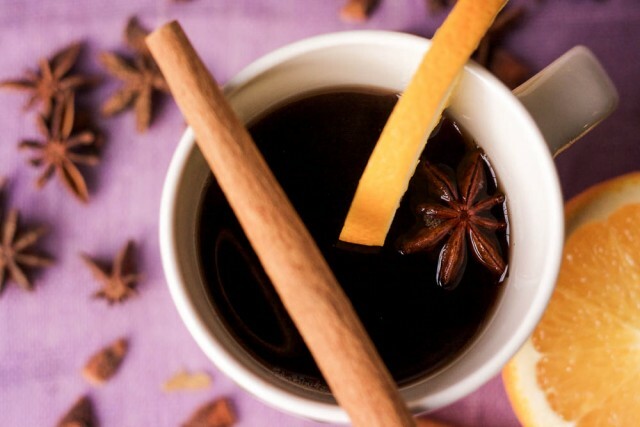 A non alcoholic mulled wine recipe, absolutely perfect for winter. Yes it’s winter. This is a sad sad fact. Although I must say that I live in Toronto and it’s the mildest winter that I can remember! I used to live in Alberta for 3 wonderful (the mountains are absolutely majestic!) but incredibly cold years! Side rant: People often ask me how cold it was in Alberta. Well, let me tell you. I moved to Alberta in the summer and noticed that all the cars had these plugs sticking out of the front hood. “Hmm, that’s pretty weird,” I thought. Then winter rolled around and I figured it out. Folks, it is so cold in Alberta that people have to plug in their cars so the engine doesn’t freeze to death! It’s true, this is a thing. Humans should not live in such cold places. Luckily the mountains and the summer months and perhaps if you are into winter activities (which I am definitely not), make up for the frigid frigid weather! 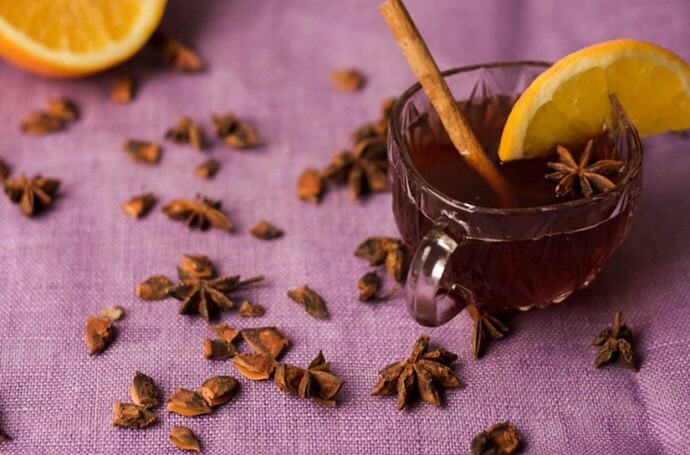 Okay back to my non alcoholic mulled wine recipe. It’s a Sunday afternoon and what better way to spend it, then working on my blog and sipping on some mulled wine. 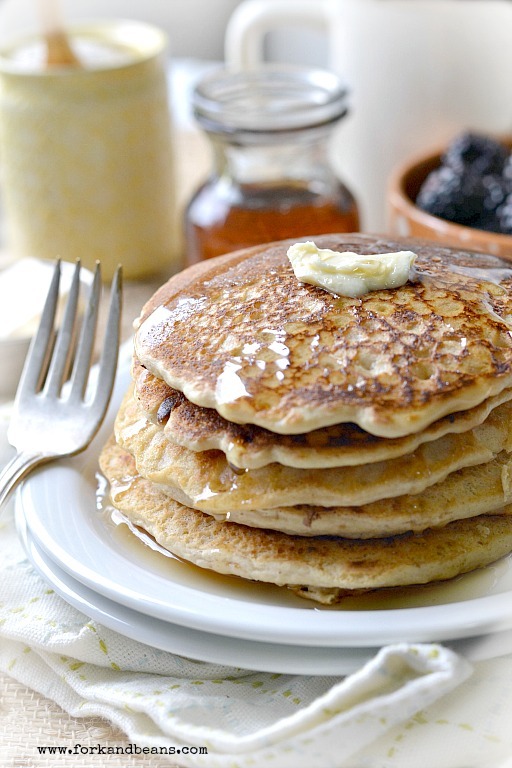 I was so very excited to research for this post on the best gluten free dairy free pancakes from scratch. I, along with you, have 7 amazing vegan recipes to choose from. 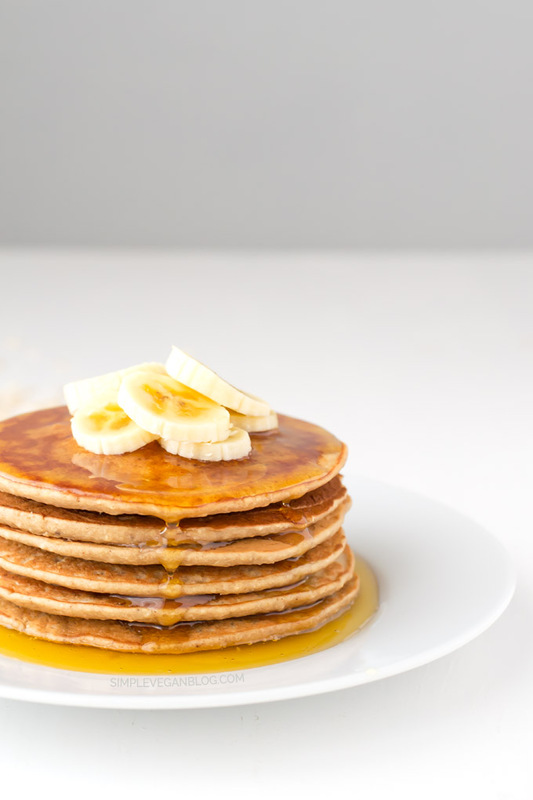 I generally try to eat the same simple breakfast during the week (usually my anti inflammatory cereal – the super power breakfast), but I give myself permission to spice it up on the weekends. 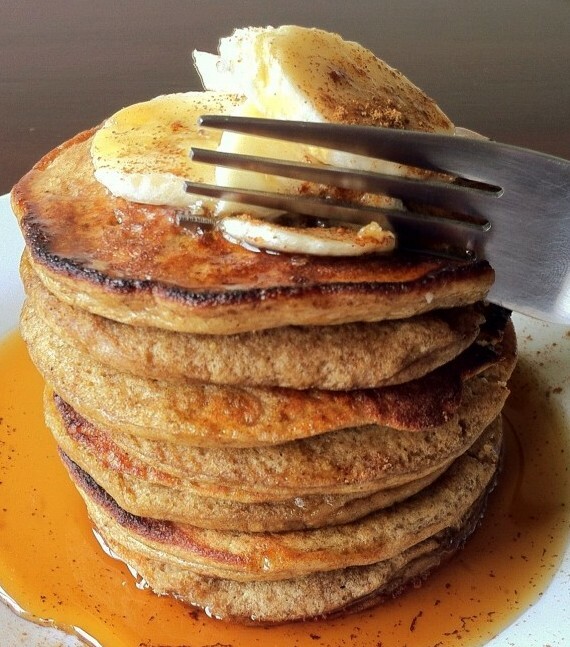 “Spicing” it up usually means some type of gluten free pancakes. Now I have so many options on the weekend! Woohooo! This is especially helpful depending on who I’m cooking for, as well. You see, I have so many different diets and preferences in my family. Let me give you an example: I am mostly vegan, grain free and sugar free, my nephew is nut free, my other nephew is dairy free, gluten free and mostly grain free. It can get complicated o so quickly! 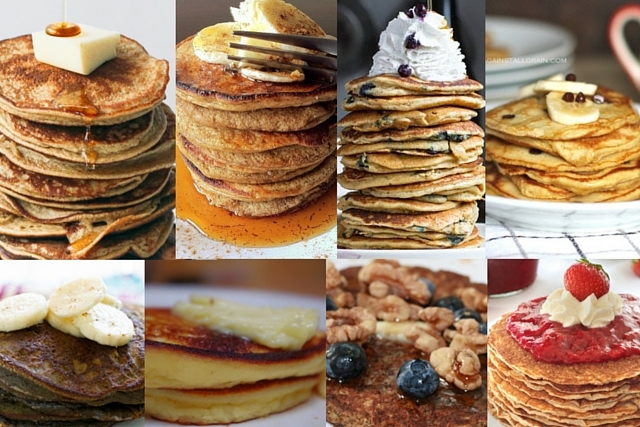 None of the pancake recipes are raw (although while I type this, I should definitely add a few options! If you come across any yummy raw recipes, let me know in the comments below!). 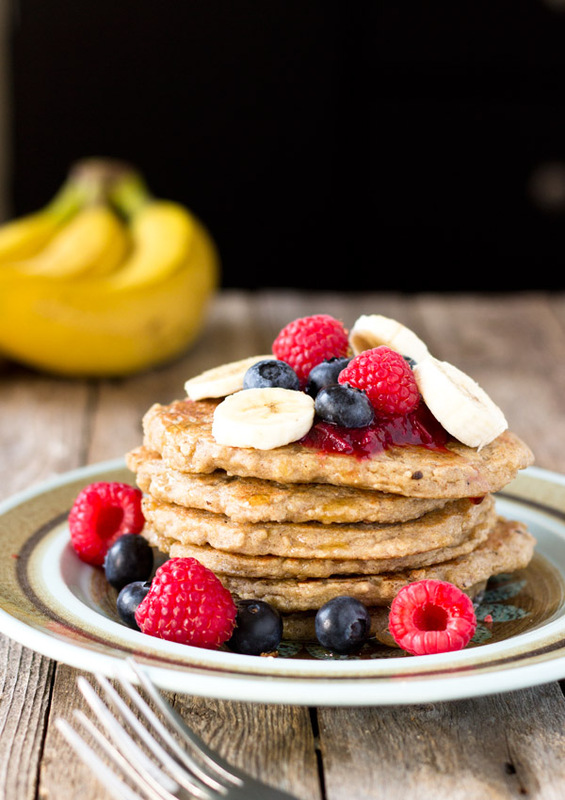 Why this makes the cut: Another ultra simple recipe naturally sweetened with bananas. 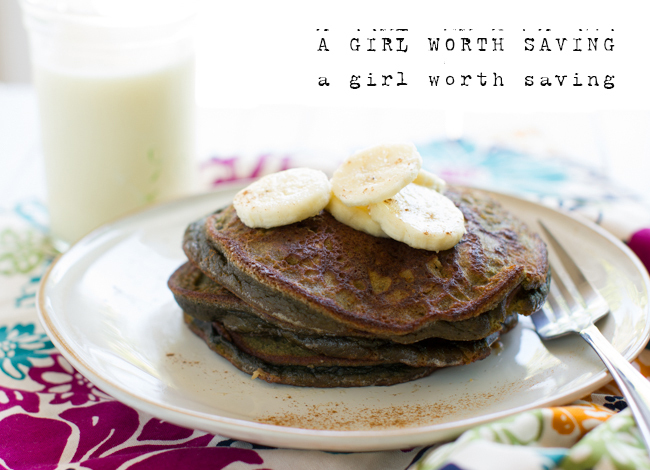 Why this makes the cut: This recipe is sugar free and naturally sweetened banana and stevia. 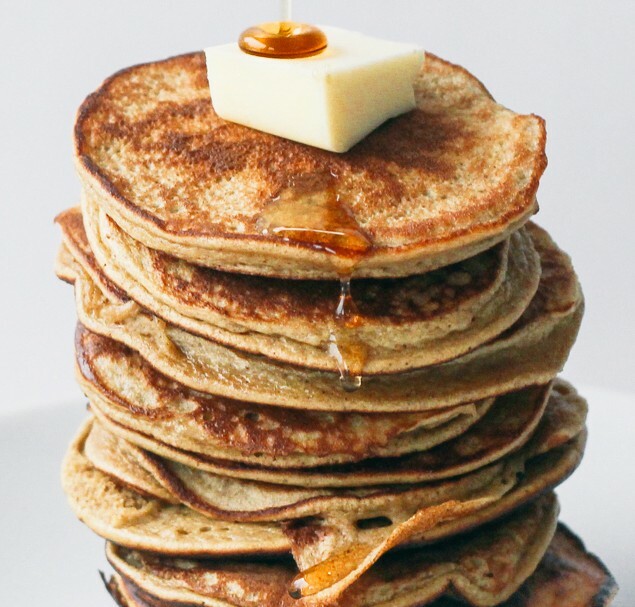 Why this makes the cut: I love the simplicity of this recipe and that it calls for applesauce (though you will need a pre-made gluten free flour mix). 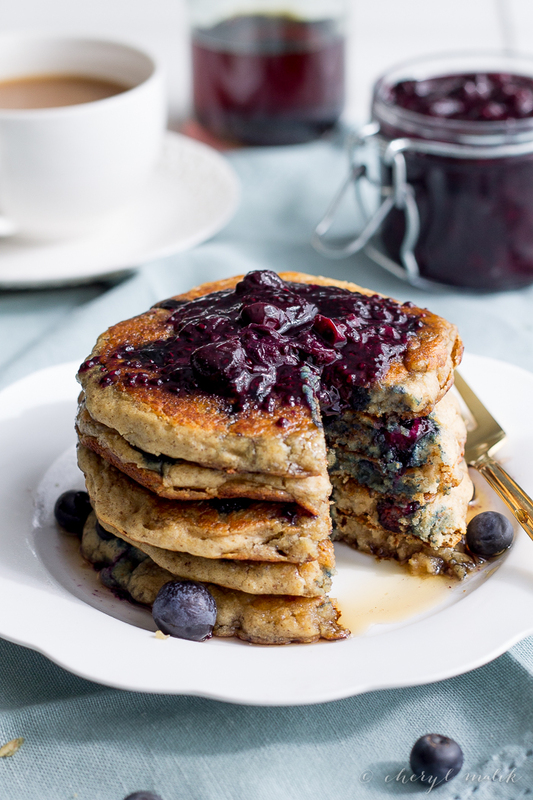 Why this makes the cut: Pancakes made out of oat flour sounds so hearty and so delicious! 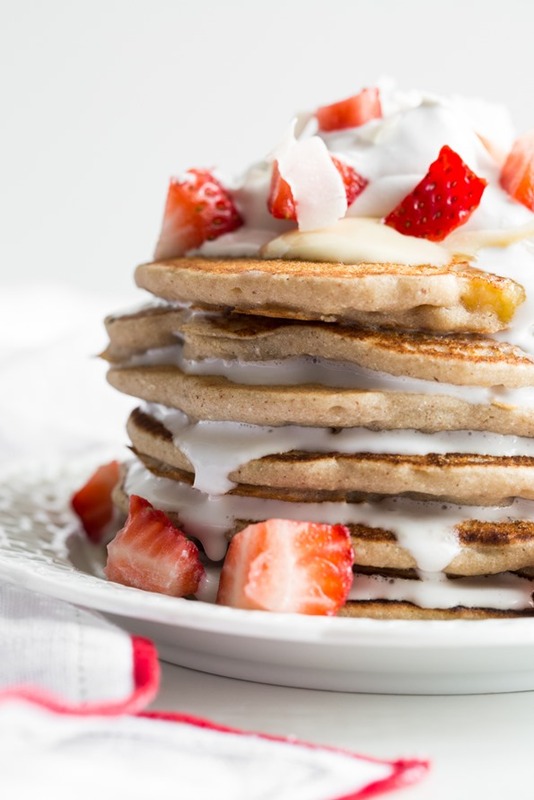 Why this makes the cut: Oh She Glows tops these pancakes with coconut whipped cream & strawberries. Hubba hubba! 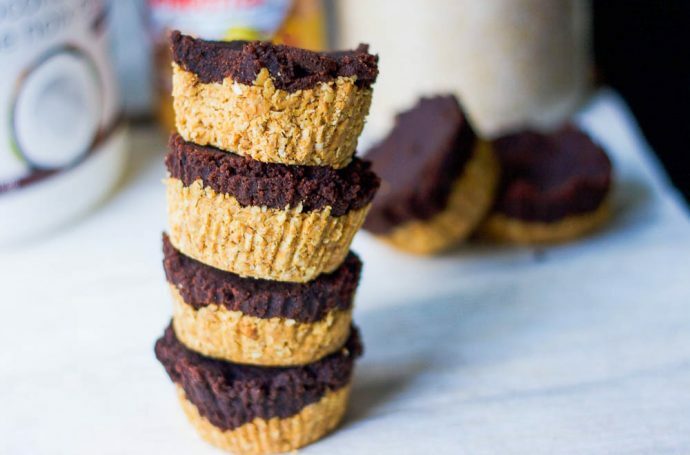 Why this makes the cut: This one has almond butter, what a great and delicious addition! 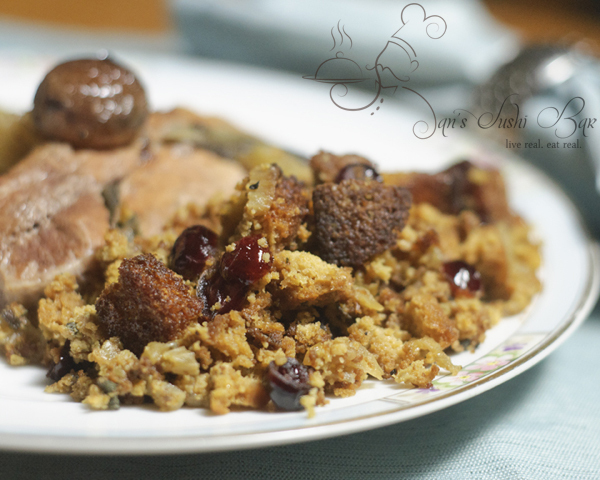 A turkey stuffing without bread recipes….a challenging task. 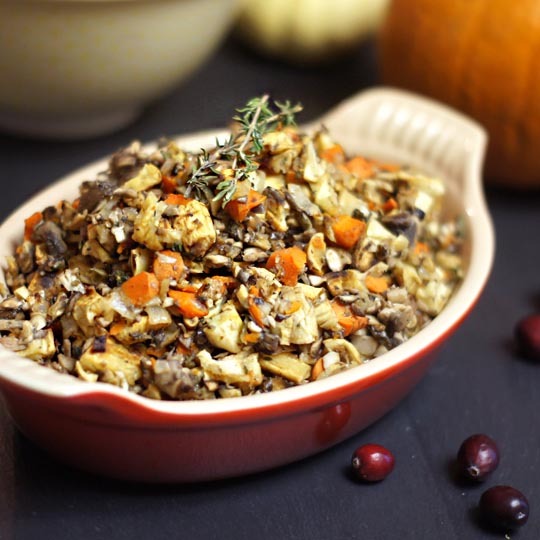 I was looking for turkey (actually Tofurky 😉 ) Thanksgiving stuffing without bread recipes, and one that was preferably grain free, dairy free and, as a bonus, vegan. This criteria was not very easy to find. 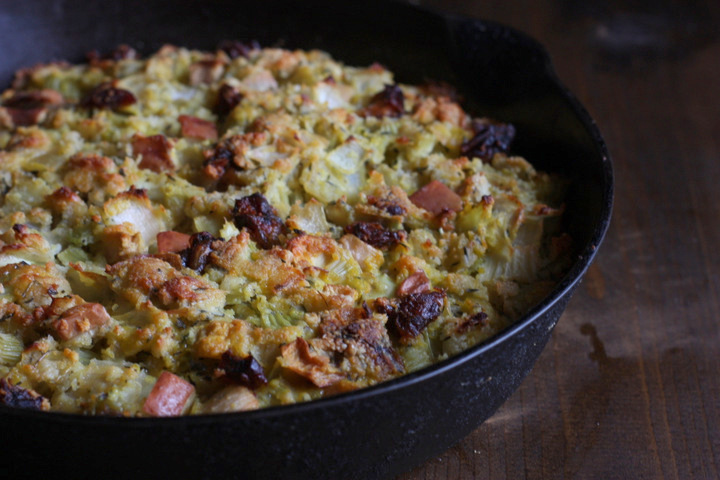 There are a number of grain free thanksgiving stuffing out there but most of them call for meat. I guess this makes sense if you are stuffing a turkey. I was not stuffing turkey though, and wanted both a grain free and vegan option. 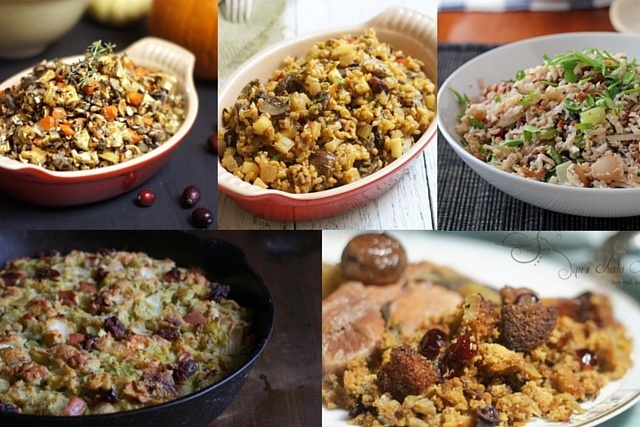 See the results for my turkey stuffing without bread recipes below. Let me know what you think and if you find any others! The first list is vegan, whereas the second list contains egg/dairy. I provide substitutions though to make all recipes vegan. If you don’t see a certain condition noted, you can assume that it doesn’t fulfill it’s criteria. 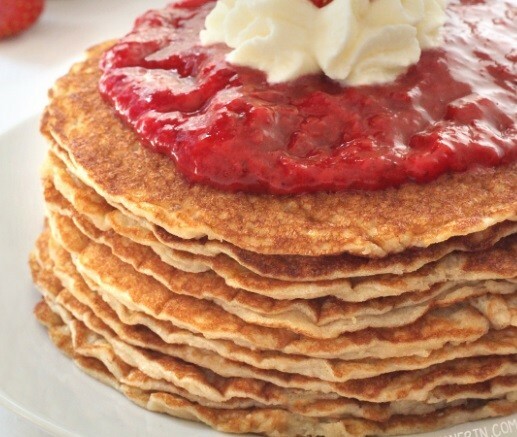 Why this makes the cut: An ultra simple recipe with only 9 ingredients that is grain free. No need for the stretchy pants folks! 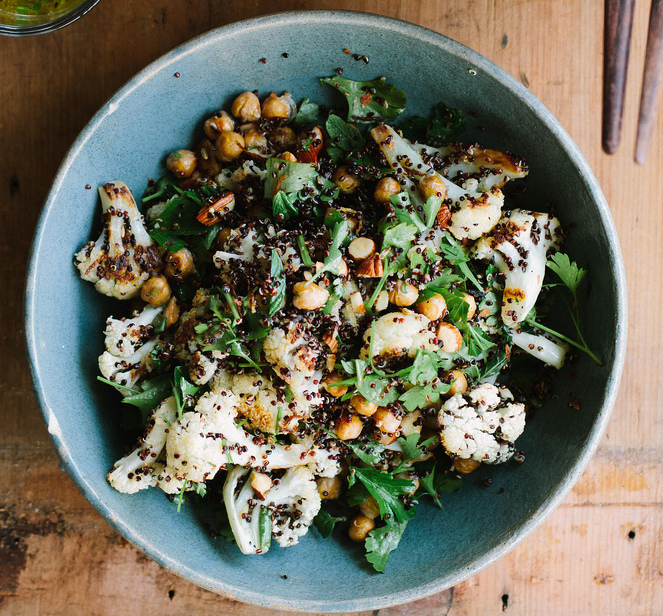 Why this makes the cut: Another wonderful recipe from Detoxinista. 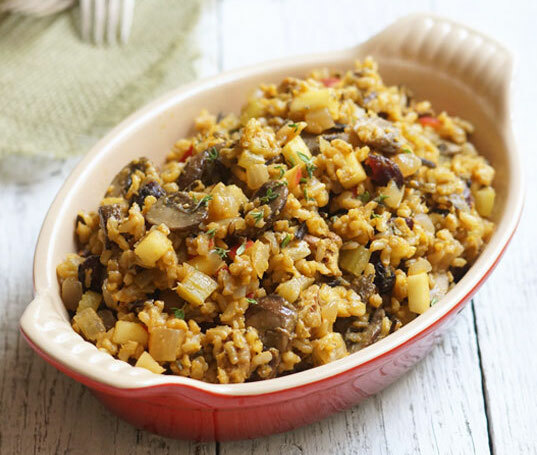 With rice, veggies and flavourful spices, this makes for an enticing recipe. 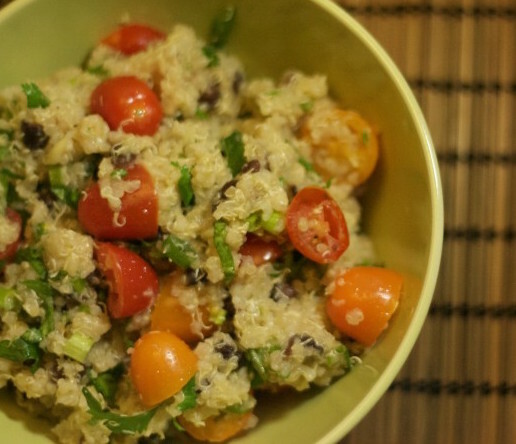 Why this makes the cut: I’m a sucker for cauliflower rice, you get rice without the grain. 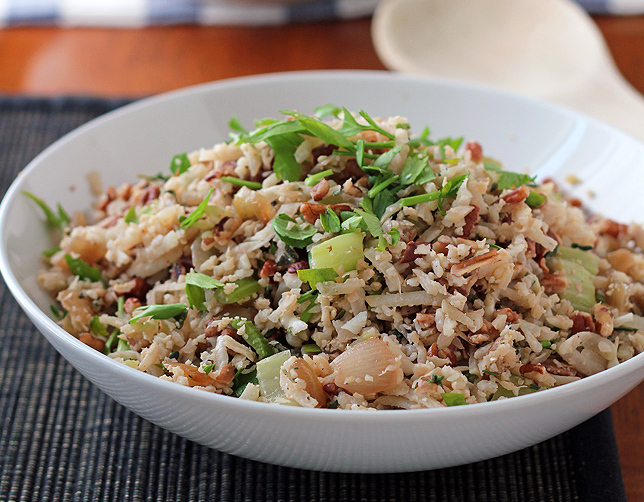 🙂 Complete with veggies, “rice” and pecans, this makes for a delicious holiday recipe. Why this makes the cut: This is my kind of Fall stuffing with dates, apple and almond flour. Hubba, hubba! Veganize with my note above.